I was recently invited to join Custommade.com, a site where people request specific items to be…. well, custom made! Being part of an organization that promotes actively buying custom made items has been wonderful! Being one of the Makers is an honor and has exposed me to a much wider variety of glass designs and challenges. I was definitely intrigued when I saw a request for a Nose Shaped Wine Stopper!! Yep, here are some of the versions of the wine stopper below! My first glass Nose ever…. I knew the wine stopper wasn’t the right size, but for now it has to work! My customer John, who was getting hitched recently, wanted this specially made to give to his brother as his Best Man’s gift. Apparently, the size and shape of this brother’s nose has been part of the family history for a long time. John sent an image of his brothers nose to work from, and I really enjoyed learning a little more about nasal anatomy….! The wine stoppers I had in stock had really short shafts, and just weren’t going to cut it, so I ended up buying several more with different shaft lengths. The first big/almost life size nose I made was a bit too cartoonish–definitely wide flaring nares (the hole parts of your nose!) but with a very long and narrow profile…..hmmmm, gotta go back to the flame. Of course, one of the intermediate nose versions I made was really great, just tooooo long for the wine stopper shaft… Rats. Time to make another one….Well, finally! The third one was definitely the charm! So now I am just waiting for him to come back from the honeymoon to hear just what the brother and the rest of the family thought of it–I’ll keep you posted as soon as I hear! Glow In The Dark Dread Beads! Handmade Glass Glow In The Dark Dread Beads. Hmmmm…. These are interesting to make on many levels! The Glow in the Dark powder is a little persnickity. It doesn’t just melt in smoothly–it has to be gently and not so gently smooshed in and worked throughout the glass I am using a the carrier glass. And if that carrier glass has issues of its own, I can create a genuine broohaha in my own studio! One of the other reasons these are funny to me is–I have short hair. I always dreamed of the thick rich hair my sister had, but no. The Hair Goddesses giggled and laughed and downright guffawed when they passed over my head. They conspired and decided to create wire like curls here and there. They sprinkled in some cowlicks and other anomalies. They made it so whenever I gritted my teeth and waited for it to grow instead of chopping it off in frustration, it grew in the shape of Bozo the Clown from the 1960’s…..you know, pointy on the sides, and much, much worse than a mullet…. But finally, finally finally, I found a cut that made it work. I just had to always keep it short and the reward was no fuss, consistently complimented curls. 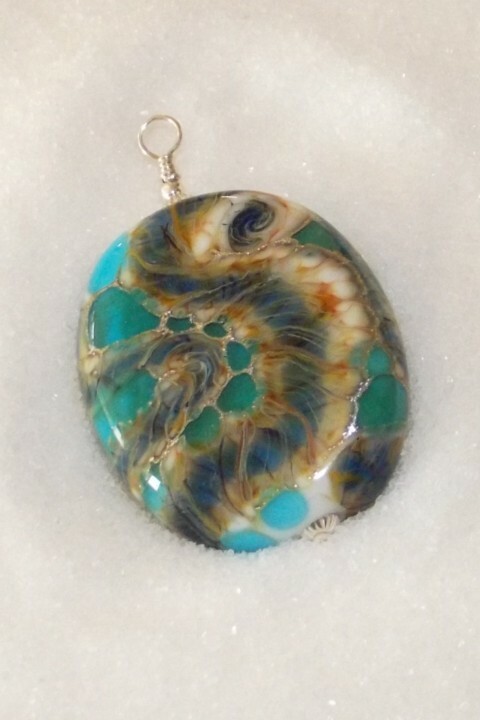 But getting back to glass Dread Beads. What does my hair story have to do with dread beads? It’s just ironic I make and sell these glass dread beads when I have no opportunity to even try them on! Of course, I also made over 4000 hair scrunchies out of all kinds of beautiful and fun fabrics back in the 80’s, so maybe I am just going through another weird cycle! I would love to see my handmade beads in your locks!!! Send me an image or two– just email it to me at my Contact Us page address with any details and a release if it’s ok to post here! Inspiration comes from so many place in this world…the call of a bird, the smile of a baby, a luxurious fabric from far away. Often it’s just a fleeting glimpse, but sometimes I keep a reminder of the shape or color to spark the idea again later. This particular inspiration of colors came from a quick scroll through my Facebook page! A friend posted a beautiful photo of Iceland on Facebook the other day. The colors were so saturated on the moonlike rocks, cool pools of water in never ending shades of aqua, and an amazing waterfall terminating in a frothy burst of spray into one of those gorgeous pools….. So when I set about torching, those colors and the sinuous flow of the water were rattling around in my head along with a million other things as usual, but this time I think it came out beautiful! 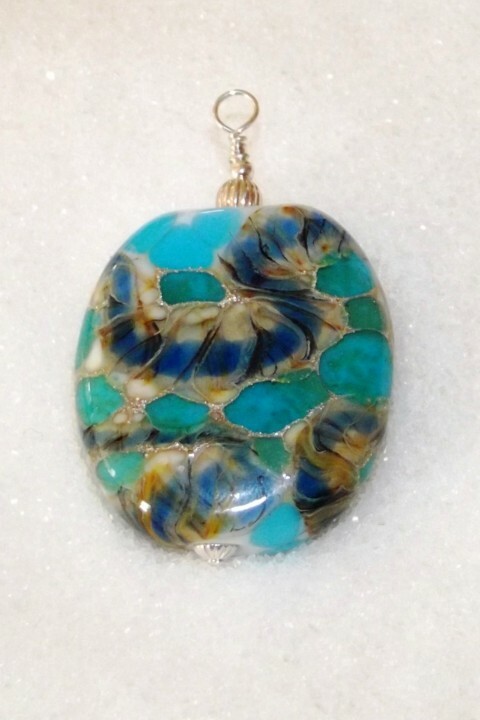 The fine silver added such a wonderful dimension to the colors and shaping. But I sure wish I could remember how I made that twistie–the cobalt blue is within and under the twist, which is hard to describe but amazing to see! And it sold soon after I posted it on my Glass Art Revealed Etsy shop which of course tickled me to pieces!! I hope to create some more interesting effects and colorful beads that remind me of some of the places I have been fortunate enough to travel–heck, Lake Tahoe is in my back yard! Let me know if there is a place in your heart, where certain shapes and colors remind you of adventures, good times, family and friends or maybe a big birthday! Happy Birthday KW! I hope you have many more! 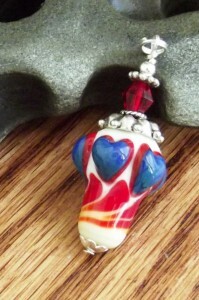 Blue hearts lampwork pendant with sterling silver accents is one of my new favorites! “Be Still My Heart” is one of my happier creations……….. meaning I was happy how it came out! What I mean is, the shape, color combination, and bumpy fun 3-D texture is what I was trying to achieve and it came out the first time I did it. Which of course set me up to fight the next one I tried to make, fought me big time, and yes that second attempt is no longer among the living beads; it is resting with the Titanic, in a watery grave in front of my torch. That watery grave is actually a small stainless steel bowl, pilfered from the kitchen. This bowl has to be cleaned out after some weeks more frequently than others, and I sometimes feel guilty “wasting” all those bits and chunks that have exploded off the mandrel when I give up on a bead. Fortunately, I don’t dunk many mandrels and kill beads that won’t behave; but when I have the very last bit of a glass rod in my rod holder that is just a nub, it is so much easier to just dunk the whole shebang, than let it cool, punty it up to another clear or same color tiny glass bit, and frugally make twisties or stringers, like I used to. The “maybe I can use that” mentality kicks in, and so the saving begins, and then the piling takes over………….I know how I get. It’s not a particularly inspiring site. So now I just work smarter and with focus, so I don’t have as many wasted pieces. Plus I have sooooo freaking many stringers now, and of course, never the color I need! Anyway, the next few heart pendants came out really nice also, and I am going to enjoy playing with other color combinations. If you have a color combo you’d like to see created, leave a comment! RAW: natural born artists is an independent arts organization, for artists, by artists. We’re a community made up of creative individuals across the nation. Our mission is to provide independent artists within the first 10 years of their career with the tools, resources and exposure needed to inspire and cultivate creativity. We welcome all genres of art including independent film, fashion, music, visual art, performing art, hairstylists, makeup artists and more. We encourage the creative success of the many visionaries and storytellers of our generation. Pretty cool, huh? I thought so too. I had just put 60 pieces (almost all of the stock I had ready and made!) into a great little shop in Midtown Reno: Twisted Minds, so I was scrambling to get enough glass goodies made in time for the show. I had received some really large mandrels–3/4 inch Emiko mandrels–and I was eager to try them out for my dread beads. 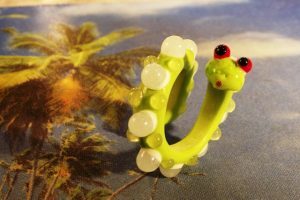 Dread Bead “Glowing Gus” glows in the dark and has a 3/4″ hole for those big dreads! These big hole mandrels have a bit of a learning curve, especially since I work on a Minor, which is a great torch, but may be just a bit underfed by my oxycon! There was just a whole lot of metal and glass to keep hot without going molten and drippy, or worse, cold and cracking! But I like the Dread Head Beads that came out so far–hope you do too–let me know! PS–The response to these big hole beads was fun to watch; everyone kept thinking they were rings and trying them on their hands. While it is intriguing to consider, I just don’t think the soft glass I use would hold up to the smacking and banging a ring is generally subjected to. Now once I get a proper Boro glass set up, well then I’ll be all over rings and stuff! Wooohooo!